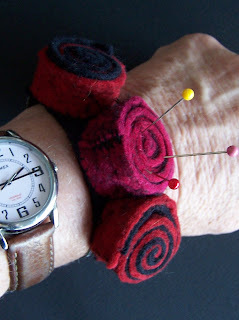 Just for fun I made this wrist pin cushion. The basis for the wristband is Grungeboard. You can buy it in sheets without any pre-made cut-outs in them. 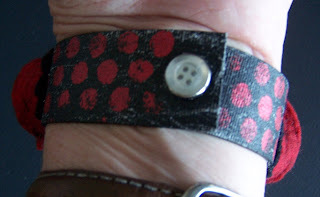 I painted it on both sides, then stenciled the polka dots on. I made holes in each end with an aul and secured this cute little button snap. Since I use wool felt in my work, I just happen to have alot of scraps. So I cut them into strips and rolled them up, like roses. I secured them with a few stitches of embroidery thread and then sewed them to the Grungeboard. It is perfect for hand sewing - pins and needles always with me as I go from room-to-room in my studio. And the Grungeboard protects my wrist from being stabbed by a pin! VEry fashionable and useful too!! I love it! What a great idea. Another inventive use for felt.